We saw some really warm days this month, in fact the high of 23.1°C on the 4th was the second hottest November day in the 100 years of records in the region (highest ever was 25°C on November 1, 1950). By the way, the high of 22.7°C the next day was the third hottest. There were 6 days that were 10 or more degrees above the average and those two days mentioned above were almost 15 degrees above. Overall it was a little more than 3 degrees above average, although this is a lot, we only have to go back to 2011 to find a warmer November. The month had 68.2 mm of precipitation, below than the average of 87.1 mm, but still within the average range. 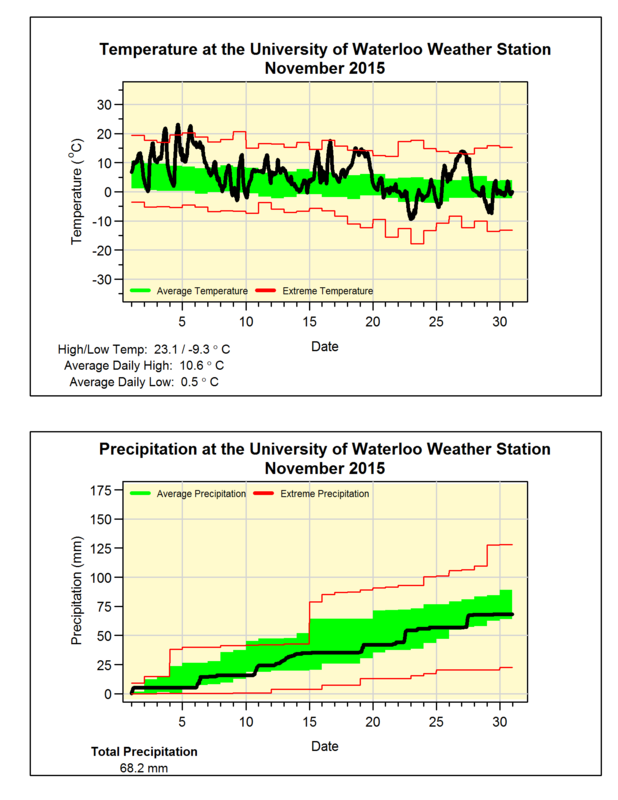 Also, with only one more month to go, we have had 748.0 mm of precipitation this year. This is much less than the average of 832.9 mm and it means we will need a really wet December (ie. over 100 mm) in order to avoid having a below average year. After not getting any snow in October, there was 12.5 cm of snow that fell in November which is pretty much the average.